Info "How do you like your steak?" Power Grill is a downloadable microgame in WarioWare: D.I.Y. and WarioWare: D.I.Y. Showcase. It was released on July 15, 2009 in Japan, June 14, 2010 in North America, and July 16, 2009 in Europe. 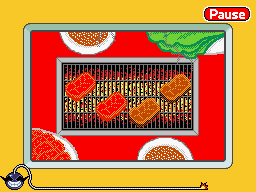 At the start of the game, there are four uncooked pieces of meat on a barbeque grill. There are plates with burger buns, lettuce and more meat scattered around the background. The player has to wait until the pieces of meat are grilled. When a piece of meat is grilled, a sound effect plays and the meat's color changes to light brown. Once a piece of meat is cooked, the player must quickly tap it. If the player taps all four in time, the game is won. "Yum!" is said in a speech bubble. The word is colored yellow with a red outline. If they wait too long, the piece becomes charred and starts smoking, automatically losing the game. The speech bubble then appears with the word "Burned!" in brown. If the player taps a piece too quick, the speech bubble says "Not done yet!" in red. This page was last edited on December 27, 2017, at 13:09.